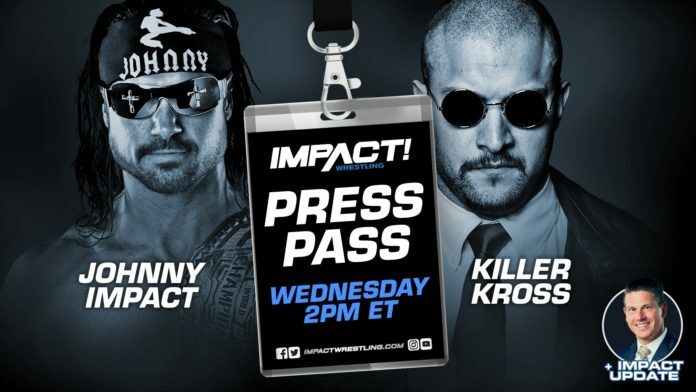 Killer Kross will challenge Johnny Impact for the Impact World Championship tomorrow night at “Final Hour”. The two were both guests on this week’s Impact Press Pass to build up their match on tomorrow night’s branded episode. During the call, I had the chance to ask Kross what led to his attack on Johnny in the back a few weeks ago. Kross then revealed some storyline information which wasn’t previously known regarding the personal history between the two. Kross continued to say that Johnny and Taya called him to watch their back in Mexico and he obliged. He would then show something almost resembling emotion when he admitted he thought the two were friends. Kross would also say that he knows a side of Johnny nobody else does. He implied it was a more vicious side and that he wants to bring that Johnny to the surface. As for Johnny’s side of the story, he feels if Kross wanted a title shot, he could have just asked for one. Johnny didn’t dispute Kross’ side of their alliance in Mexico either. Johnny then said that Kross likes theatrics and wants to “send messages” and “make statements”. “Those messages and those statements were obviously more important than whatever type of friendship or relationship we had,” Johnny said.